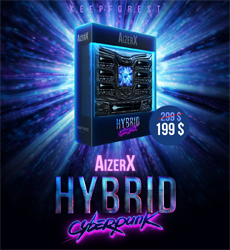 AizerX Hybrid Cyberpunk Toolkit is the latest addition to the Keepforest's successful AizerX series. Get it now for at an introductory price of € 199! Offer ends by May 1st! Inspired by the atmosphere of the cyberpunk world, this library offers a lot of character and personality with a cinematic futuristic vibe that perfectly captures the philosophy of the genre. As a powered-by-AizerX-engine tool for composers and sound designers, this library is able to simplify the sound design process, and also opens up new possibilities for incredible creative ideas. AizerX Hybrid Cyberpunk Toolkit offers the signature sound randomizing feature, delivers a deep library of samples from classic braams, trailer hits, signals, alarms to screaming resonators and distortions. The centerpiece of the AizerX Hybrid Cyberpunk Toolkit is a selection of tempo-synced drum loops, hybrid pulses, and stems of different categories. You can create variations of energetic, dynamic drum and pulse patterns at different tempos, varying among themselves and combining individual sound layers. A collection of multi-sampled playable basses, leads, plucks, pulses and signals is also a main feature of the library. And by tradition, in collaboration with various artists established in the movie trailer industry, KeepForest have prepared a special Artist Stems category, which contains stems and cues made by the artists, where you can borrow elements, structures, and tricks from experienced composers and will help you get inspired, learn from experience and save your time.